Luxury and low-key go hand-in-hand at the city’s best casino-resorts, where the hot new restaurants are all about balance. At the new Mott 32 inside The Palazzo in Las Vegas, the head of a one-and-half-pound Boston lobster rests atop a pool of soft, silky tofu and chunks of fresh lobster meat. The dish, which includes chile paste, Sichuan peppercorns, and cloves, is spicy and mala but not overwhelmingly so. The lobster is the star, and the contrast of flavors and textures between the lobster and the tofu is delightful. If you want the typical pyrotechnics of Sichuan food, you’re better off heading off-Strip for a meal at Chengdu Taste. But Mott 32’s lobster mapo tofu is splendid in its own way. It’s a reminder that eating in a Vegas casino-resort is about luxury ingredients, but also about balance. 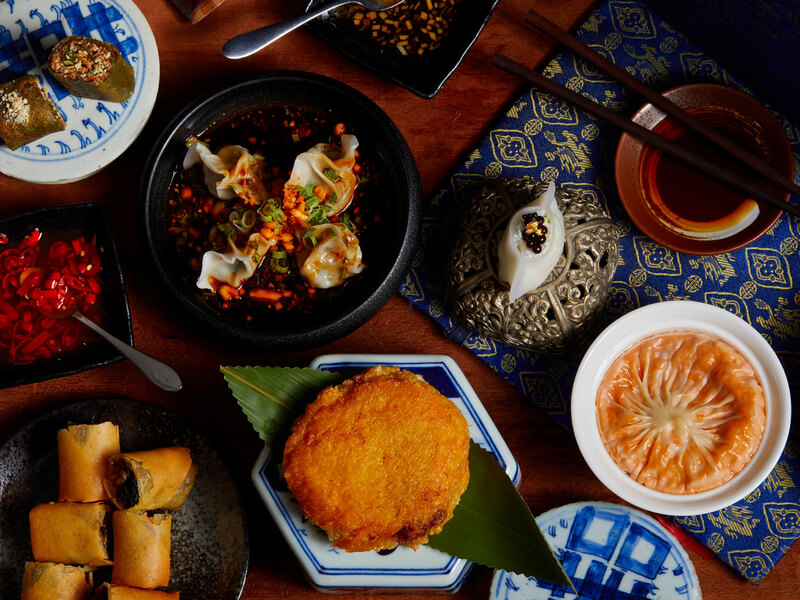 At chef Alan Ji’s Mott 32, Peking duck is the main event for a lot of tables, but you can also marvel at culinary tricks like hot-and-sour soup dumplings made with Ibérico pork. These dumplings are definitely spicy and tangy, but the bold flavors don’t overshadow the richness of the top-tier pork. 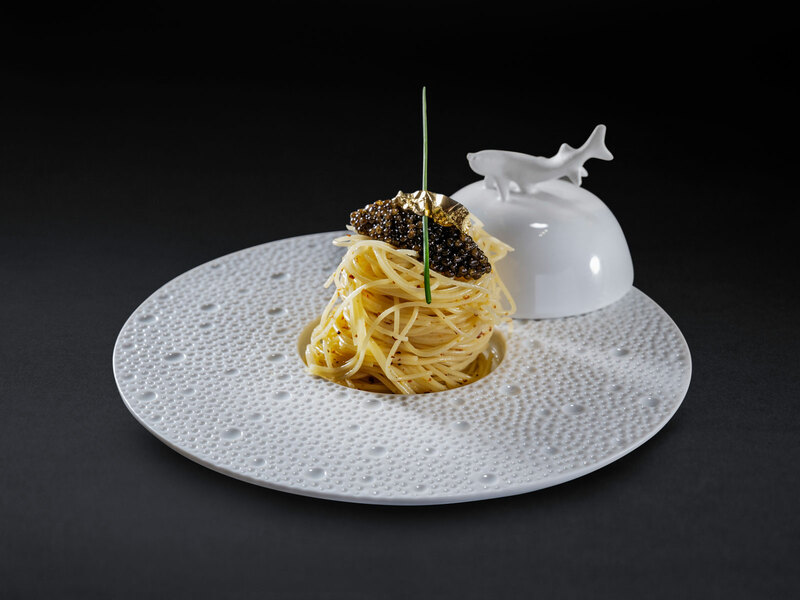 Balance probably isn’t the first thing you think about when you see a plate of chilled capellini with caviar and gold leaf. But at the new Mr. Coco, ace mixologist Francesco Lafranconi’s hidden lounge at Palms, chef Juventino Magana serves a dazzling buttery pasta that’s completely harmonious with the caviar atop it. The gold leaf doesn’t taste like anything, of course, so that doesn’t affect the flavor of this dish. This is high-end bliss that you’ll probably want to pair with a glass of Champagne. Magana, who previously cooked at Joël Robuchon at MGM Grand, says he plans to make carbonara with ultra-premium Ibérico de Bellota ham, which sounds at least as over-the-top as pasta with caviar and gold leaf. But we feel like he’s got the skills to pull it off nicely. Also new at Palms is Sara’s, Michael Symon’s “meateasy” tucked inside Mabel’s BBQ. 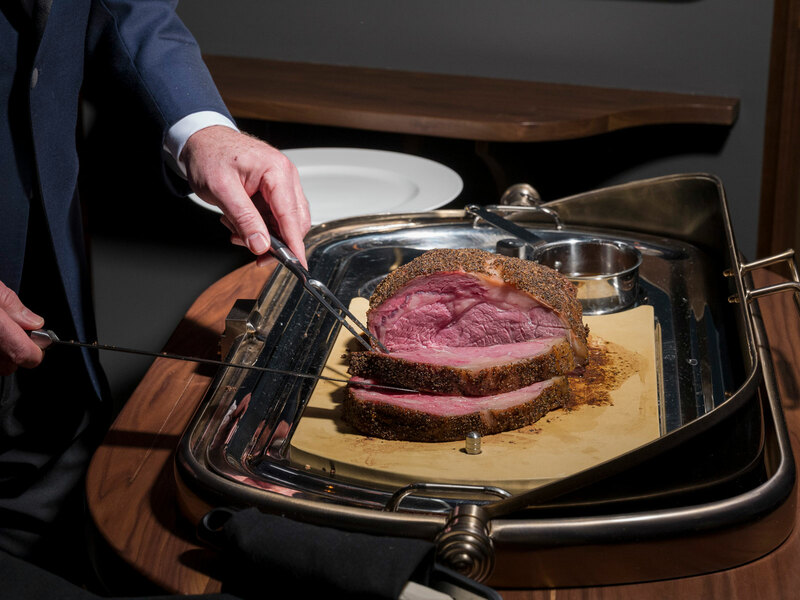 This is an elegant supper club where a tuxedoed server brings over a cart with smoked prime rib. It’s a restaurant where a classic and perfect Dover sole with brown butter, capers, parsley, and lemon is filleted tableside. 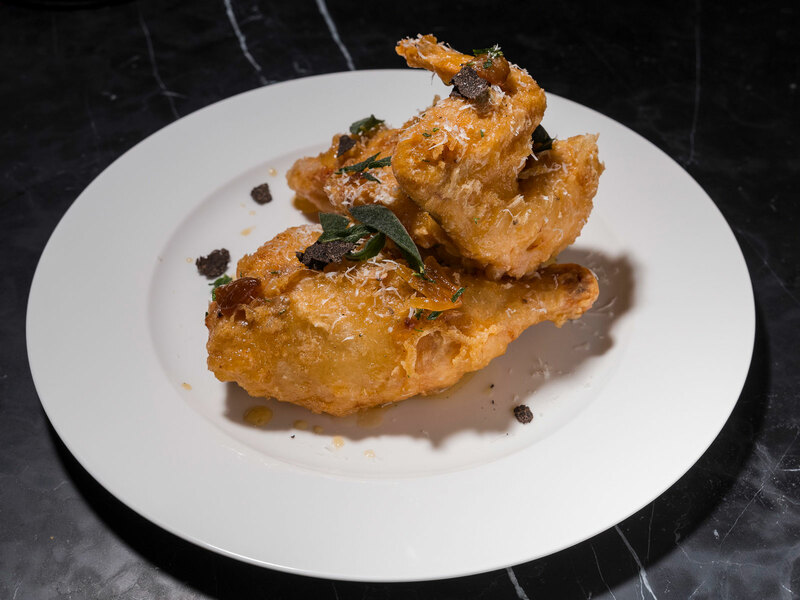 The fried chicken at Sara’s is topped with black truffle and honey. The cherries jubilee is flambéed tableside. But maybe our favorite thing about Sara’s is how you can channel your inner Fred Flintstone and order some prime-rib bones as a starter. These big bones with lots of meat attached are labeled as “crispy beef bones” on the menu. They come with horseradish, parsley, citrus, and shallot. Your waiter might recommend you start with a knife and fork before using your hands. Feel free to gnaw until all the meat is gone. After you’re done, there are hot towels with lemons for your hands and face. Sara’s is a lot of fun. One amusing thing about Mr. Coco and Sara’s is that eating like this can be considered a low-key night in Vegas, especially at the Palms resort with the huge Kaos club that opens April 4 and has booked headlining DJs like Marshmello and Skrillex many weekends. Seeing a sultry lounge singer at Mr. Coco is definitely counterprogramming to a night of fist-pumping and dubstep at Kaos. This is a very specific Vegas form of balance. So at The Venetian, you can rage at Tao before or after you enjoy Sam Ross cocktails at The Dorsey, or you can indulge yourself at the new outpost of chef Angelo Auriana’s The Factory Kitchen. Auriana, who also has The Factory Kitchen in L.A.’s Arts District, is a pasta master. 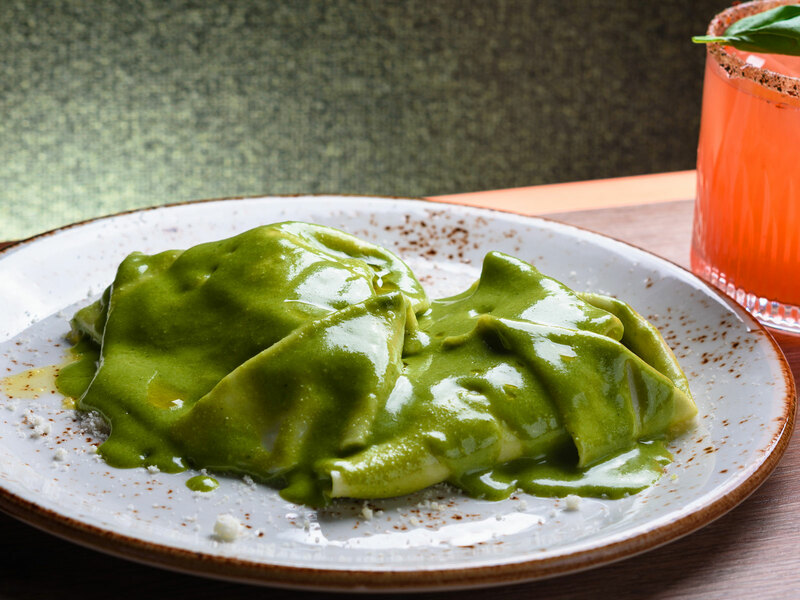 One showstopping example of his prowess is a strikingly green mandilli di seta, a handkerchief pasta with Ligurian almond basil pesto that tastes as bright as it looks. There are also many exemplary braised meats as well as crowd-pleasing porchetta at The Factory Kitchen. This restaurant offers all kinds of comfort. At the new Park MGM, you can eat kimchi jjigae near the DJ booth at Roy Choi’s Best Friend or you can dance after sipping cocktails from A-list mixologists at Mark and Jonnie Houston’s On the Record. Or you can settle in for a night of steak and wine at Manzo, the Eataly meatery where chef Nicole Brisson has a three-tiered wood-burning grill used to prepare fantastic cuts like dry-aged Creekstone Farms rib eyes. This is an “Italian butcher’s restaurant,” so pastas include a tremendously delicious and hearty agnolotti del plin with beef, pork, bone marrow, and black truffle. If you’re looking for a nightcap or a night of drinking without entering a big nightclub, The Cosmopolitan of Las Vegas has a couple good new options. Ghost Donkey, hidden in the back of the Block 16 Urban Food Hall, is your place for mezcal and tequila, whether you want cocktails, tasting flights, or an excuse to pound shots. 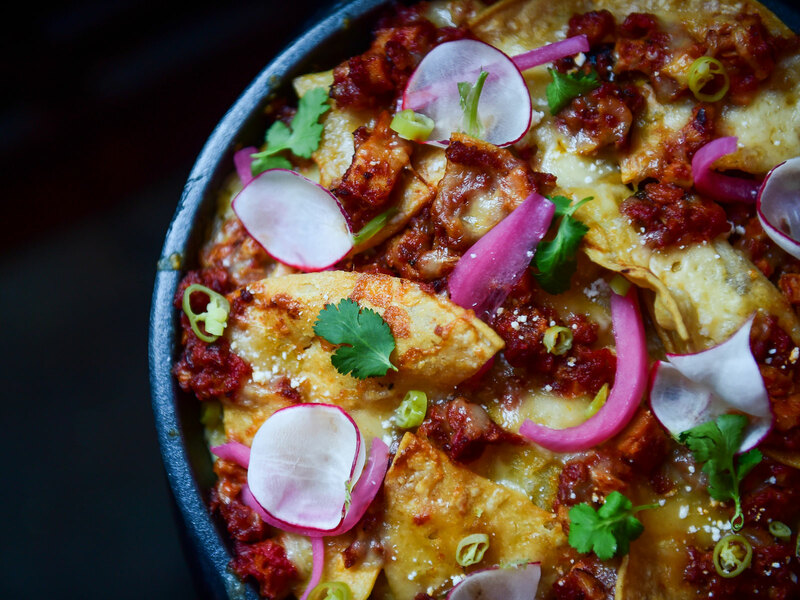 If you’re hungry, we recommend Ghost Donkey’s chorizo nachos, or you can also order truffle nachos when you’re feeling fancy. Or just walk out the secret door and into the primary part of the food hall, where Hattie B’s serves hot chicken until 11 p.m. on weekdays and 2 a.m. on weekends. Also at The Cosmopolitan is The Barbershop Cuts and Cocktails, which opened March 15 with a performance from Gavin Rossdale and Bush. Yes, you can get a haircut and catch live music here, but the Prohibition-era cocktails, the big whiskey collection, and the speakeasy vibe are what will make you want to linger. Over at Mandalay Bay, Hazel Coffee & Cocktails has cortados in the morning and then turns into a lounge in the evening with classic and modern versions of Manhattans, margaritas, martinis, and much more. We came by for an early drink and ordered a modern Old Fashioned. What showed up was a glass box full of smoke. Inside was a little porron-like glass. Drinking this cocktail meant holding it over our head and pouring it into our mouth. This was an over-the-top way to have a cocktail, especially while the sun was still shining brightly outside. But the Old Fashioned itself, with Laird’s apple brandy, Toki whiskey, ginger syrup, and angostura bitters, was pleasantly smoky and totally balanced.